SOLIDWORKS MBD has come a long way since it initially released back in 2015. Adding dimensions or using existing design dimensions to publish directly into a manufacturable PDF saves time and interpretation errors. 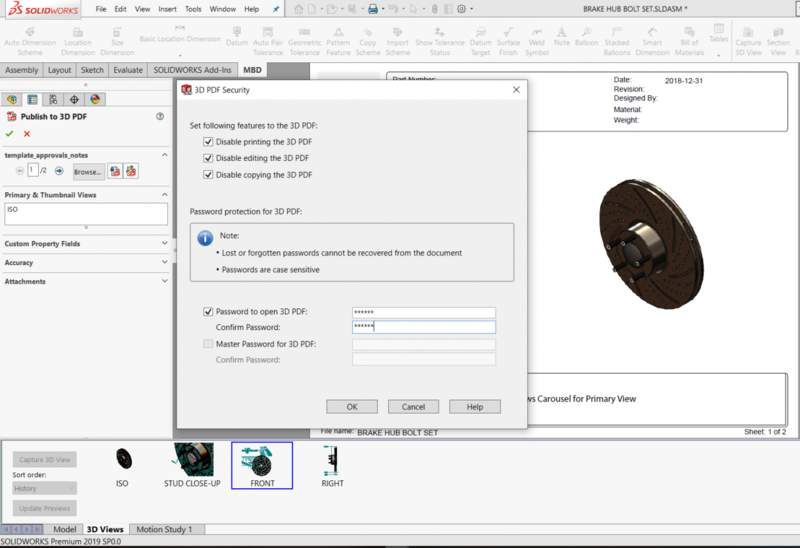 SOLIDWORKS 2019 has now added more features to the already innovative PDF. You can now add security measures to the 3D PDF. In the “Publish to 3D PDF” area there is a “Security Settings” button added right beside the “Browse” button. Clicking it will open up a new window. The PDFs created by SOLIDWORKS MBD were open ended, which means they could be edited by anyone. In the default templates there were empty boxes that provided the opportunity for notes to be passed along the line for the ideal approval and passed back down for any revisions. This function can now be locked out for any unwanted hands touching. The same goes for printing and copying, both features prevent the PDFs being passed onto unwanted eyes as much as it can. Lastly, a password can be added to cover all bases of security. Check the box and enter the desired password. A warning though, this is not editable after the PDF is saved out. If you forget and need to change the password, it’s important to note that a new PDF is to be created.